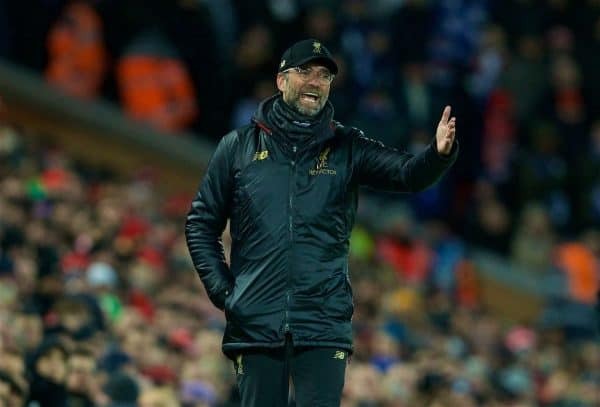 Liverpool were held to a bitterly frustrating draw at Anfield by Leicester City as Jurgen Klopp’s side were unable to open a seven-point gap at the top. Some sloppy passing early on saw Alisson put Jordan Henderson under unnecessary pressure on the edge of the penalty area, before Jamie Vardy very nearly took advantage of another error with the Brazilian slow to release the ball. Improved thereafter, and was alert to come off his line and sweep up loose balls whenever necessary. Produced a sharp reflex stop to prevent a Roberto Firmino own goal in the second half. 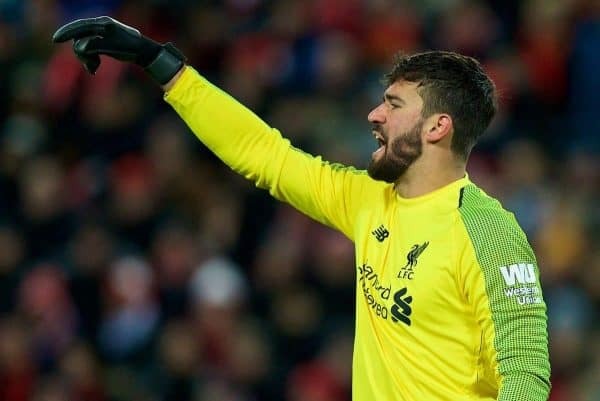 Filling in as an auxiliary right-back, the captain was fortunate not to give away a free-kick in a dangerous position early on after an unwelcome pass from Alisson. Grew into the game well and offered a constant outlet down the right, timing his forward runs intelligently and delivering some quality crosses into the box. Displayed his strong reading of the game to step in and win the ball on the front foot on multiple occasions. One of Liverpool’s most progressive players on the ball, Matip showed courage and conviction with his incisive driving runs to break Leicester’s defensive lines and feed clever passes into the final third. Booked early on for bringing down Vardy on the counter-attack, but steered clear of trouble thereafter and was relatively untroubled in a defensive sense. The Dutchman’s availability was a concern having picked up an illness which prevented him from training fully during Liverpool’s mini-break and he wasn’t quite at his usual domineering best on this occasion. 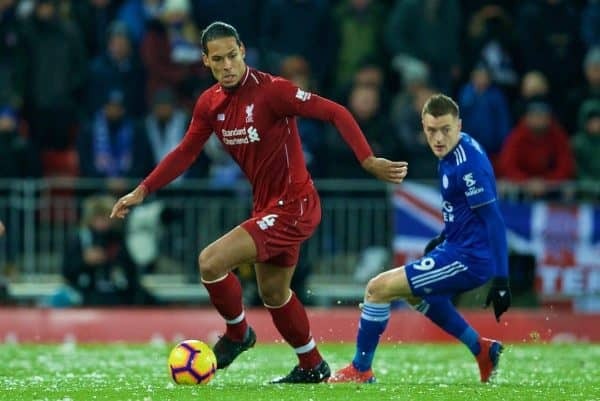 Played some lovely switches of play out to Henderson, but Van Dijk will be disappointed with himself for a rare lapse of concentration which saw him lose track of Harry Maguire for Leicester’s equaliser. As ever, full of endeavor and quality in possession and was involved in the buildup to Liverpool’s early goal, finding Firmino inside the box with a clever pass. Unfortunately, his evening was clouded by an uncharacteristically needless foul which gave away the free-kick leading to Leicester’s goal on the brink of half-time. An unusually poor, but costly, decision at a crucial point in the game. A relatively quiet evening for Wijnaldum who had also overcome slight fitness concerns of late, and was tasked with being Liverpool’s deepest midfielder and keeping the ball moving quickly through the middle of the pitch. Put in his usual shift off the ball, but could have been more progressive at times with the nature of his passing, as Liverpool became a little too slow and predictable after a high-tempo start. 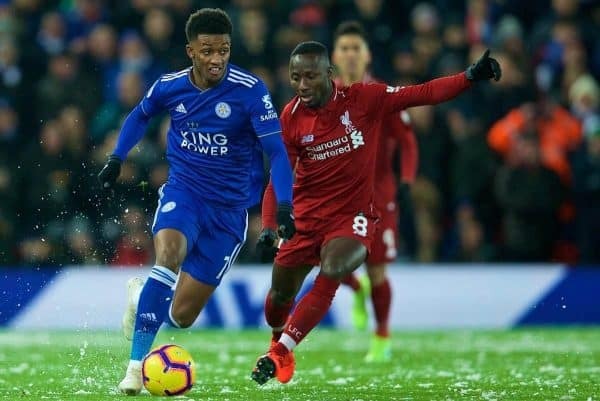 Defensively he was exceptional, racing back a number of times to prevent Leicester breakaways and played a vital role in helping keep the Foxes pinned back. After what has been a tough period for Keita, struggling to make an impact when given the opportunity, he lined up in a more central role here which appeared much more natural than the left-sided berth he has fulfilled recently. After an understated but efficient first half, Keita was unfortunate not to win what would have been a crucial penalty as he drove into the box, only to be felled by Ricardo Pereira as he was about to shoot. Was subbed just as he was enjoying his most effective period in the game. Another frustrating display from Shaqiri as he struggled to make an impact throughout. While many of his best moments this season have come making an impact off the bench, he cut a strangely subdued figure here once more and was unable to get on the ball frequently enough to influence proceedings. Replaced by Fabinho after 67 minutes. Certainly one of Liverpool’s brighter performers on an otherwise forgettable night, Firmino came close to making it 2-0 after a superb piece of control on the chest saw Kasper Schmeichel keep out his shot with a smart save early on. Although somewhat wasteful in possession at times, Firmino showed a constant desire to get himself on the ball and try to create openings, and brought another strong save from the Leicester goalkeeper after a skilful dribble in the box in the second half. Worked hard defensively as ever, too—including a fine stretching tackle which almost resulted in an own goal, but certainly prevented Leicester taking the lead. Opened the scoring with a delightfully taken goal after just two minutes, with a lovely first touch before slotting the ball clinically into the bottom corner. 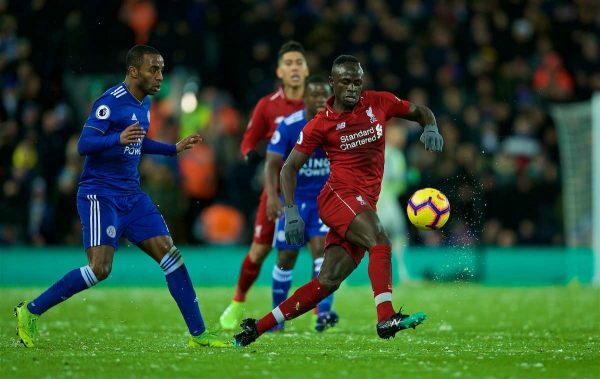 Mane looked by far Liverpool’s most dangerous threat throughout and never stopped driving at Leicester’s backline and spinning away from opponents in tight areas. Worked back impressively to cover his defensive duties, too. An extremely quiet evening for the Egyptian who was largely marked out of the game and was starved of space and service. Despite several promising moments, Salah was quickly crowded out as soon as he had possession and in truth never came especially close to scoring. A soft penalty claim was predictably turned down by Atkinson as Maguire shrugged him off the ball in the box, while also putting an arm across his face. Showed plenty of willingness to get on the ball, but never really added any of the cutting edge Liverpool needed to make the breakthrough late on. 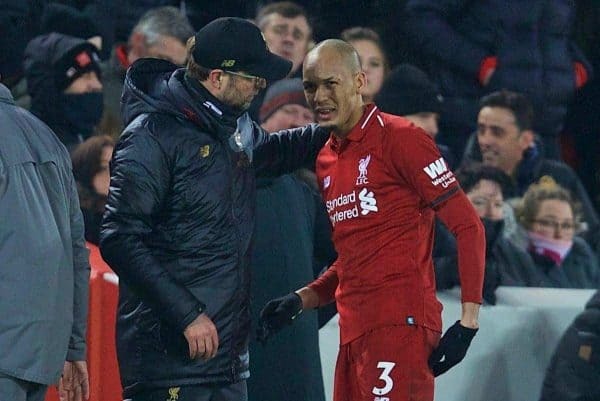 Arguably the only substitute who made a positive impact, Fabinho’s sharp forward passing did help Liverpool build some pressure late on and it was difficult not to feel as though the Brazilian’s inclusion from the start might have made a significant difference. One wasteful shot spooned over the crossbar spoiled a promising attack late on. Sturridge couldn’t make the decisive impact in the little time he had on the pitch. Subs not used: Mignolet, Lovren, Origi, Camacho. Eyebrows were raised over the team selection before kick-off, with no obvious right-back in the lineup. 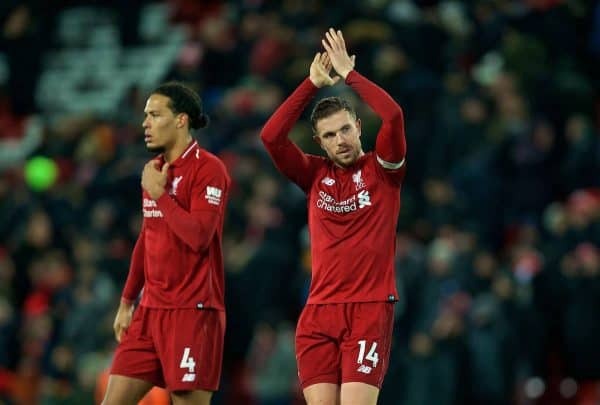 The decision to go with Henderson worked reasonably well, although Fabinho’s omission was a strange one and Liverpool could have done with the Brazilian’s muscular, driving presence in midfield from the start. It might also have been easier to change the game using one of Keita or Shaqiri from the bench, rather than starting both. The result is hugely frustrating given the missed opportunity to go seven points clear and create some welcome breathing space. Klopp will be keen to ensure that Liverpool bounce back against West Ham on Monday night with a much-improved performance.